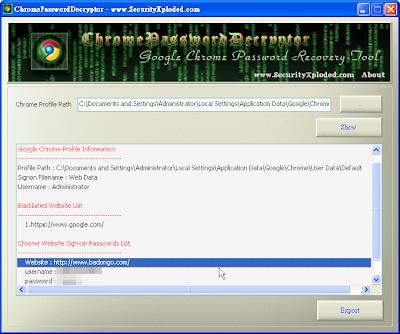 ChromePasswordDecryptor tool makes it easy to decrypt or recover the login secrets stored by Chrome. It automatically detect the default chrome profile path for the current user and displays all the stored login credentials in clear text after decrypting them. It also shows all the blacklisted website entries for which user has prompted Chrome to not to remember the passwords.